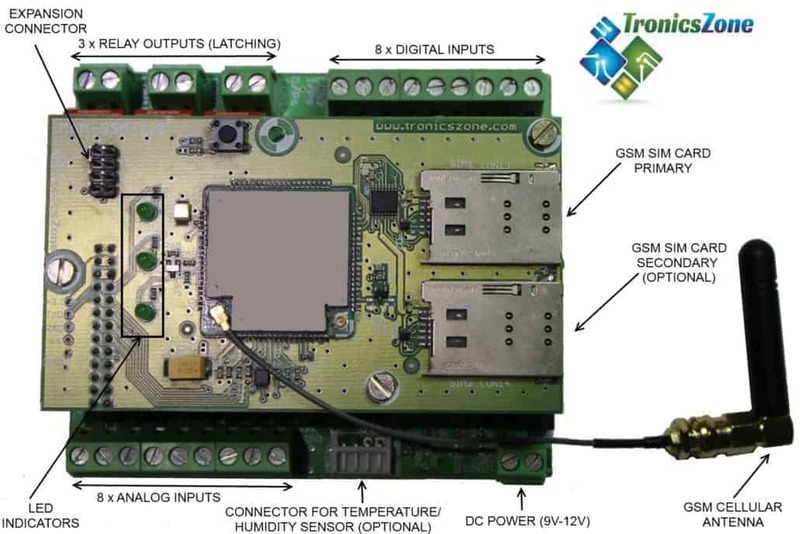 IoT Gateway / Machine to machine (M2M) hardware – Reports the states of analog/digital inputs & also RS-485 modbus slaves over internet or SMS. GPRS/3G/SMS based Remote Alarm Monitoring & Reporting. Remote Water & Liquid level monitoring & control. Monitor your Equipment/Machinery & Process remotely. Remote Control – Turn ON/OFF equipment & machinery from remote locations. Get alerts when specific events occur such as Fire, Pump failures, Machine failures, Low fuel/fluid levels, Temperature/Humidity alerts etc. Can monitor & report any physical or environmental conditions using different sensors & transducers. Eg. Temperature, Humidity,Voltage, Current, Pressure, Torque, Flow rate, Liquid levels etc. Uses 3G modem or Quad band GSM cellular modem. Two modes (a) Alarm reporting mode (b) Continuous monitoring mode. In Alarm reporting mode, SMS will be sent automatically when inputs change as configured (active high or active low) or when Analog inputs cross certain logical conditions. Can be used for very low power operations using batteries. In Continuous monitoring mode, the inputs are continuously reported through GPRS/3G to a TCP/IP server & outputs can be controlled by the server. Status of digital & analog inputs as well as outputs can be polled at any time through SMS commands. Battery low reporting through SMS and/or GPRS. Output relays can be controlled through SMS and/or GPRS. Latching relays are used to preserve state in case of power failures. Buzzer on and off control remotely through SMS and/or GPRS. Analog inputs alarms are sent when condition is satisfied (voltage exceeds certain threshold or goes below certain threshold including hysteresis). When analog input alarms are enabled, then ADC is sampled every x secs (configurable) and at other times it will be in sleep mode. All inputs (digital + analog) & output status periodic reporting configurable for every x secs over SMS and/or GPRS. Dual SIM capability, the 2nd SIM will be used as backup in case there is no connectivity using the 1st SIM. GPRS function enabled or disabled through SMS. If GPRS is enabled, it will report all the input, output status periodically every y secs (configurable) to a TCP/IP server (eg. webserver). Has an I2C bus connector to optionally connect to an external temperature/humidity sensor and monitor the same. Optional RS232/RS485 interface for monitoring and reporting external RS232/RS485 based sensors & equipment like Energy meters, Tilt sensors, Accelerometers, Fuel or liquid level sensors, Weight/Pressure sensors, Vibration sensors etc. All configations can be done through SMS. Optionally USB can be used for configuring the device also. Can be customized to suit specific customer requirements at nominal costs. Please email design@tronicszone.com for a quote.